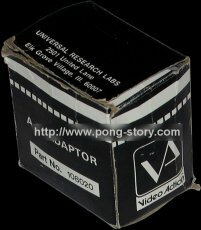 Universal Research Labs (URL) entered the video game market in 1973 when they were contracted by Allied Leisure to manufacture the circuit boards of their Paddle Battle game (an Atari PONG version licensed to Allied). 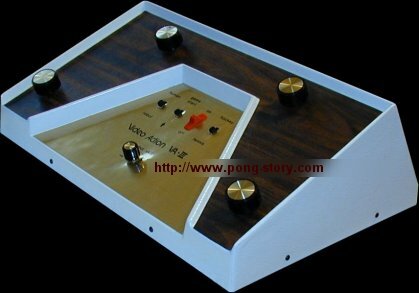 They also produced their first Video Action arcade game, model VA-I, housed into an octagonal table. A few thousands were produced. After the Allied Leisure fire and other financial problems, URL found itself with millions of dollars of electronic components. URL had to do something with this inventory, so one of its co-founders quickly decided to get into the consumer market. Thus was born the second Video Action game, model VA-II. It was first announced in 1974, and released later in 1975 in two forms: one with a TV set and a coin box for use in bars, and a home version which could use any TV set. The former was more successfull as it was designed to make money. The latter didn't sell as well as the former because of its high retail price (the circuit board itself cost around $200 to manufacture). An early advertisement for Christmas 1974 listed it at $550 but it appears that the regular price was almost $500. 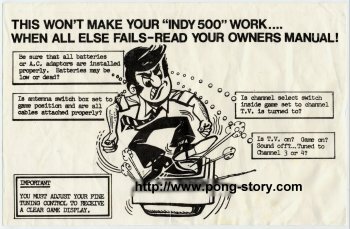 1975 was the first year when several PONG games reached homes: Magnavox Odyssey 100 and 200, Executive Games Television Tennis, First Dimension FD3000, Atari PONG, and VA-II. Earlier VA-II units only have a flat white formica board as shown below, whereas later specimens have formica on both sides. Video Action (VA2) unit in its home version. 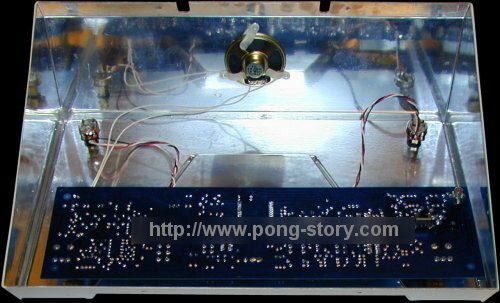 Inside VA2: coin-op board with power supply and RF modulator. VA2 control panel showing the game selector, ball speed switch, volume control, etc. 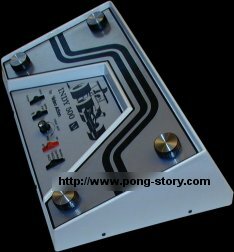 URL's coin-op market revived around 1976 and the company released Video Action III (model VA-III), a cheaper unit that played two games (Tennis and Hockey) with a Robot mode to play against the machine. This Robot mode was very new in the home video game market (although a few hobbyist projects already featured it) and even featured a variable intelligence (that is, the speed the machine uses to move the bat in order to catch the ball: the faster the speed is, the harder it is to beat the machine). 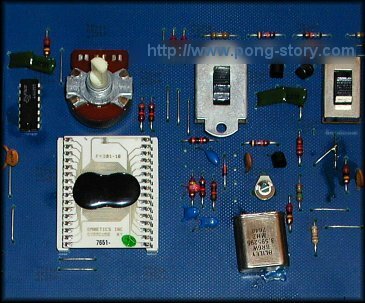 Instead of TTL chips used in VA-II, VA-III used CMOS chips (about 90 of them), which consumed much less power, hence the possibility of using batteries, which saved the cost of an internal mains power supply. 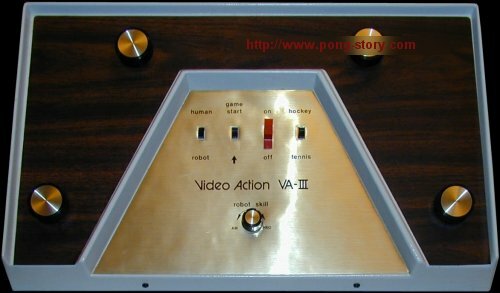 Video Action III unit with a nice woodgrain design. Circuit board of VA3. This one dates june 1976. 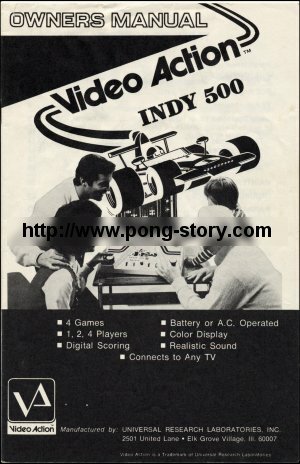 Later in 1976, URL designed a cheaper version of VA3: INDY 500, also called Video Action IV (model S-100). This game used a pseudo single-chip device which included the VA-III circuits, to which were added two car racing games. This was URL's answer to the existing video game chips like GI's AY-3-8500. Because the ciruits of that 4-game design were very advanced, they could not fit a single silicon chip. Two chips had to be made and connected together. URL contracted Omnetics Inc. to mount and connect the two chips on a white thick film substrate, hence the large chip package. The chip was given the reference F-4301. The first Christmas season after the chip was completed had Sears, Penney's, and other retailers (which all had placed huge orders) waiting for delivery. The chip yield then fell to zip and almost bankrupted URL. Very few manufacturers used this chip. 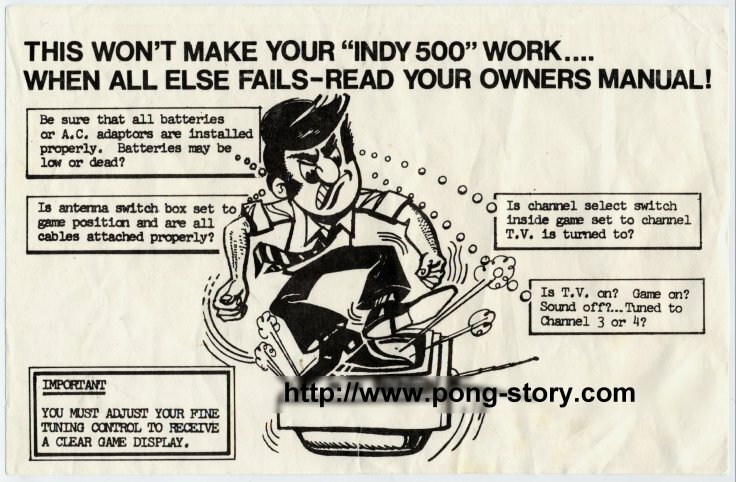 The only American manufacturer known to have used the F-4301 chip is Sears for their Speedway, Speedway IV and Indy 500 games. 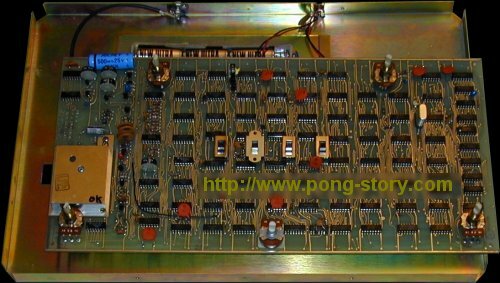 In Europe, the chip was also used by Interton (Germany) in their Video 2800 game, Intel (InterElectric, Germany) in a small system with no particular name, MBO (Germany) in their Tele-Ball VIII system, and another British kit which name is currently unknown. It is believed that around 5,000 Video Action IV games were made. 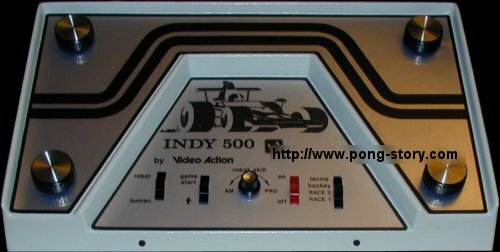 Indy 500 (Video Action 4 model S-100) unit. Circuit board of Indy 500 with close-up on the F-4301 2-chip module. AC Adaptor, amazing VA4 Trouble-shooter (click picture for large scale), and owner's manual.